The Colorful Vintas. 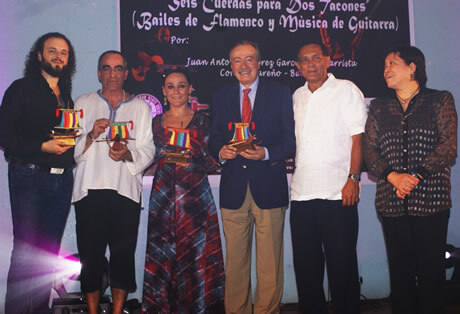 Tokens of Appreciation were given by (1st and 2nd from right, respectively) Dr. Rebollos and Mayor Lobregat to (from left to right) the guitarist Antonio Suarez Garcia, executive director Carlos Villarubia, the dancer Concha Jare�o, and the Instituto Cervantes Director Sr. Jose Rodriguez. Centro Pastoral, Zamboanga City – It was a dazzling night with Spanish artists Don Juan Antonio Suarez Garcia, a classical guitarist and composer, and partner Concha Jareño, renowned dancer and choreographer together with their Executive Director Don Juan Carlos Villarubia. They came all the way from Spain to spend a momentous night with the Zamboangueños on October 13, 2010. The talent showcase started off with a solo performance by Antonio who passionately played his guitar. The audience felt awed upon hearing the beautiful and soulful rendition. Shortly, Concha accompanied the guitarist on stage to perform a jaw-dropping Flamenco dance. Her moves were perfectly coordinated with the vibrations of the strums of Antonio. They were a wonderful couple on stage; a combination of visual and musical arts, a spectacle indeed. These artists are internationally renowned for their prowess in playing classical guitar pieces and dancing Flamenco, respectively. They even performed in Dublin, Ireland and in London, England last September before they came to Zamboanga City. The Seis Cuerdas para Dos Tacones (Bailes de Flamenco y Musica de Guitarra) was a project of the Western Mindanao State University (WMSU) through the Office of the Culture and the Arts (OCTA) in coordination with Gobierno de España-Ministerio de Cultura, City Government of Zamboanga, Spanish Program for Cultural Corporation (SPCC), Instituto Cervantes (IC), and Agencia Andaluza para el Desarrollo del Flamenco. The event was graced by the presence of Sr. Jose R. Rodriguez, General Coordinator of the SPCC and the Director of IC; City Mayor Hon. Celso Lobregat together with some city councillors, heads of government offices and other known figures in the city; as well as WMSU President Dr. Grace J. Rebollos with other WMSU officials. Prior to their visit here, the Spanish folks thought of Zamboanga as ‘wild’ or ‘jungle-like’ but “It is a surprise for us…people are very good…” Carlos, the Executive Director said in his limited English.